The only way to write is one word at a time. This is either reassuring or Absolutely Horrifying, depending how to you look at it, but it’s the truth. But, as anyone who writes books can also tell you, books do have a mind and a voice of their own. And a successful book is one that talks to the reader. Still, the general notion of a theme is sometimes useful to a writer, in that it influences both the content and the organization of your story. Not always—or even often—in a deliberately conscious way, but it’s there. And once you’ve assembled most of a book, you really ought to be able to tell someone who asks what the theme is. I didn’t really think about the themes of my books for some years, but some intelligent NPR interviewer asked me one day whether I could sum up the book we were talking about in a single sentence—and I realized that in fact, I could summarize the theme of each book in a single word. While my books are often referred to (by people at a loss as to what to call them) as romance novels, they aren’t. 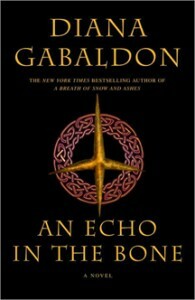 However, OUTLANDER is in fact the only one that has the necessary structure to even pass as a romance novel. I.e., it is a courtship story; its central mechanism concerns the coming together of two people in a (theoretically) permanent pair-bond. Beyond that, though, it explores the nature of love on a number of levels and in a variety of contexts. We have Claire’s conflict over (truly) loving two men. We have Jamie’s love for his father, his sister, and his home, and Murtagh’s love for his godson. We have the deeply conflicted love between the brothers MacKenzie. We have the love of the clansmen for each other, their laird and their home. We have the very complicated emotions of Captain Jack Randall—though whether any of these constitutes love, or merely obsession, is a matter for the reader to decide. And we have Divine Love, which Claire more or less stumbles into as an act of desperation. But almost every relationship in the book rests on love, and the entire story is a testament to the power of love. This book deals primarily with the development of a specific marriage—Jamie’s and Claire’s—but along the way, looks at quite a few other relationships and arrangements that explore the concept. We have the arranged marriage of Mary Hawkins and the elderly, warty Comte de Vigny. We have the loveless but pragmatic marriages of class and convenience seen in the French Court, and the casual, selfish affairs that contrast so strongly with the sense of commitment and self-sacrifice that lies at the heart of a good marriage. Later we see the doomed love between Mary and Alex Randall—and the pragmatic marriage between her and Jack Randall (based on Jack’s love for his brother, rather than for Mary). We see the peace of a long-term, deeply committed marriage between Jenny and Ian at Lallybroch—and appreciate the various threats there are to these social bonds, and how people sustain a marriage—or don’t. 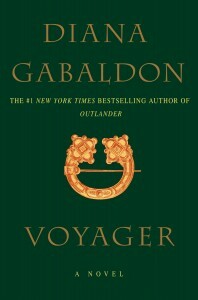 VOYAGER has a lot of adventure, changing of times and places, seeking of destiny, and so on—but the underlying theme is that of a person’s search for identity, and how they define themselves, in their own eyes, or those of another, or those of society at large. By marriage, by career, by calling—or by recognition of one’s own essential being. You see this worked out most noticeably (of course) in Claire’s and Jamie’s story, first as she seeks the husband she’s lost and longed for, and then as they look for safe landing and a place in which they can survive together. 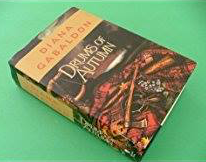 If DRAGONFLY IN AMBER deals with the establishment and growth of a marriage, DRUMS does the same with the concept of family and its importance in a person’s life. One of the major notions—developed throughout the books—is that a family doesn’t consist only of people who share DNA, nor that a family ceases to be important if the members of it are separated—or dead. Jamie and Claire’s family as they settle in North Carolina consists of Fergus, Marsali, their son Germain, and Jamie’s nephew Ian—as well as Brianna, the daughter Jamie has never seen. 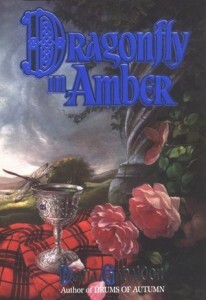 As for that daughter, her shock at learning the truth of her parentage leads her to find her family and risk everything to save them, while Roger MacKenzie Wakefield (born a MacKenzie, but adopted by his great-uncle) risks everything for her sake—and becomes her family, as well, along with her child, Jeremiah (who may or may not be Roger’s, but whom Roger claims firmly as his own). 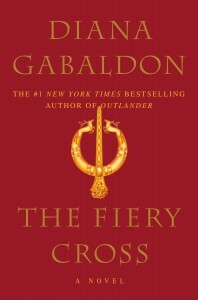 THE FIERY CROSS continues the “building” sense of the books, from courtship to established marriage, to family and now to the formation of a community, as Jamie reclaims his original destiny as laird and leader, supporter and protector of a community. We saw him do this (briefly) at Lallybroch, and then during the years after Culloden, when he led the prisoners at Ardsmuir and kept them (mostly) sane and alive by forging them into a community. Jamie has always been defined (to himself, as well as to the reader) by his strong sense of responsibility, and here we see it in full play, as he gathers tenants to his land at Fraser’s Ridge, with the help (and occasional hair-raising hindrance) of the time-travelers in his family. As with any worthwhile story, the process of self-definition of a protagonist (whether that’s a single person or a group) is a process both of discovery and of conflict. Stumbling blocks, opposition and danger are the tools that nature uses to carve a striking personality from the native rock. 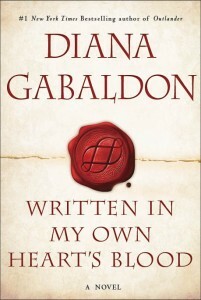 And thus we see not only the formation of the community of Fraser’s Ridge (a parallel and microcosm of the emerging America), but the individual struggles of Jamie, Claire, Brianna, Roger and others, to fit into their changing environment and preserve their own identities and discover their callings in the process. I’m tempted to say that the one-word theme of this book is “survival,” but the means by which so many people survive the vicissitudes of a world spinning rapidly out of control is really a better theme, I think. 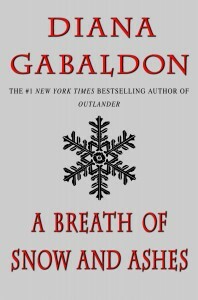 In this instance, we explore the fierce loyalty of Claire and Jamie to each other and to their family, but beyond loyalty to people, loyalty to ideals and ideas is a huge thing at this time in the history of America, and the conflict of those loyalties is paradoxically both the cause of social fracture and the means of survival when the world is coming apart at the seams. We see other forms of loyalty at work—the loyalty of greed and self-protection, among the Brown gang and Hodgepile’s band of marauders, the loyalty to tradition and leaders among the Cherokee, the loyalty to King, country, and regiment shown by John Grey—and the loyalty of friendship, as we see between Lord John and Jamie. And ultimately, we see the loyalty and love of parents, who will make any sacrifice for the sake of their children and the future. The icon on the cover of the U.S. edition of this book (at right) is a caltrop—a military weapon dating back to Roman times. The icon on the U.K. edition of the book (below left) is a very beautiful skeletal leaf—showing the superiority of the Orion art department to my own artistic instincts, but embodying the same underlying concept: the complex and fragile linkages between people, times, and circumstance. 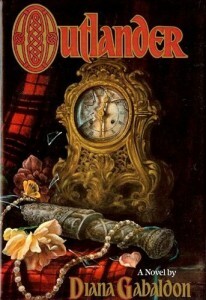 The book follows four major storylines, which connect in major and minor ways, and—depending on which cover image you prefer—display the importance and resilience of such connections in time of wars and personal conflicts, or show the underlying veins of nurture and sustenance between people that keep them whole in spite of the stresses of passing time. As with A BREATH OF SNOW AND ASHES, I considered an alternate one-word theme—in this case, “Mortality.” Not death, as such, but a realization of the finite nature of life, and what this does to people. That was a much harder concept to put on a cover, though. 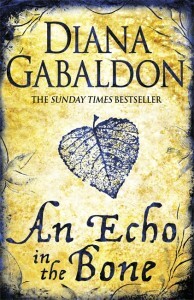 If ECHO’s word was “nexus,” most acute readers are probably expecting MOBY’s to be “spaghetti”—or, possibly, “octopus.” It isn’t, though; it’s “forgiveness” — both the giving of that balm, and the refusal to forgive, and what giving or refusal does to both giver and recipient in either case. We see this concept in operation among the major characters—particularly with regard to William’s response to discovering his true paternity, and with regard to Claire’s efforts to deal with meeting the man who raped her, and her response to what Jamie does about it. But we also see it in the lesser passages dealing with incidental characters: Mrs. Bradshaw and the slave Sophronia, for example. Mrs. Bradshaw shows a courageous determination to help the girl (thus forgiving her for what might have been seen as complicity in her husband’s infidelity, by a lesser woman), despite her inability (and who could wonder at it?) to forgive her husband, and the apparent internal struggle the situation costs her. Rachel forgives Ian instantly upon his confession that he was married before, and his admitting the fear that he might not give her children. Jamie forgives Claire (and, reluctantly, Lord John) for having slept with each other while thinking him dead—but can’t bring himself to forgive Lord John for baldly acknowledging his own desire for Jamie. Claire instantly forgives Jenny, the sister-in-law she once loved deeply. Jenny emphatically doesn’t forgive Hal, the commander of the men who hurt her family and contributed to her husband’s death—but has words of counsel and support for Claire as to how she might deal with her realization that the man who raped her is alive, sharing her daughter’s experience. Buck MacKenzie can’t forgive himself for the ways in which he failed his wife. Roger explicitly forgives Buck for his role in getting Roger hanged—but demonstrates the boomerang effect of forgiveness, in which the sense of injury returns and must be dealt with afresh. Fanny forgives William and Jamie for not being able to save Jane—but you can plainly see that they don’t forgive themselves, and will live with the effects of their failure for some time. “Spaghetti” is probably the right term, really…. Copyright © 2018 by Diana Gabaldon. All rights reserved. Please do not copy and paste this essay; instead, please share the URL of this webpage. This page was created on Wednesday, March 21, 2018, and was last updated on Wednesday, March 21, 2018 at 3:50 a.m. (PT) by Diana’s Webmistress. Diana also posted this essay on her official Facebook page on Wednesday, March 14, 2018.